'If ever there was a book calculated to make a man in love with its author, this appears to me to be the book.' William Godwin, the author's future husband, was not alone in admiring Letters written during a short residence in Sweden, Norway, and Denmark, Wollstonecraft's most popular book during her lifetime. Not easy to categorize, it is both an arresting travel book and a moving exploration of her personal and political selves. 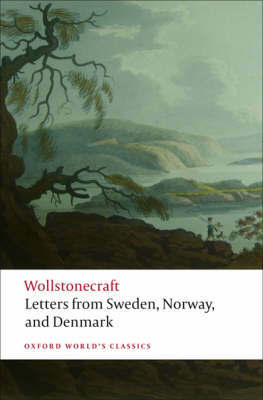 Wollstonecraft set out for Scandinavia just two weeks after her first suicide attempt, on a mission from the lover whose affections she doubted, to recover his silver on a ship that had gone missing. With her baby daughter and a nursemaid, she travelled across the dramatic landscape and wrote sublime descriptions of the natural world, and the events and people she encountered. What emerges most vividly is Wollstonecraft's courage and ability to look beyond her own suffering to the turmoil around her in revolutionary Europe, and a better future. This edition includes further material on the silver ship, Wollstonecraft's personal letters to Imlay during her trip, an extract from Godwin's memoir, and a selection of contemporary reviews. ABOUT THE SERIES: For over 100 years Oxford World's Classics has made available the widest range of literature from around the globe. Each affordable volume reflects Oxford's commitment to scholarship, providing the most accurate text plus a wealth of other valuable features, including expert introductions by leading authorities, helpful notes to clarify the text, up-to-date bibliographies for further study, and much more.